�Looking Back/Moving Forward,� a nostalgic historical Musical Revue celebration, opened November 15th with a note-perfect premiere, commemorating the past 30 years of Tri-School Theatre�s fantastic production of musicals, and giving audiences a behind-the-scenes look at Tri-School Theatre from the people who initiated and built it. 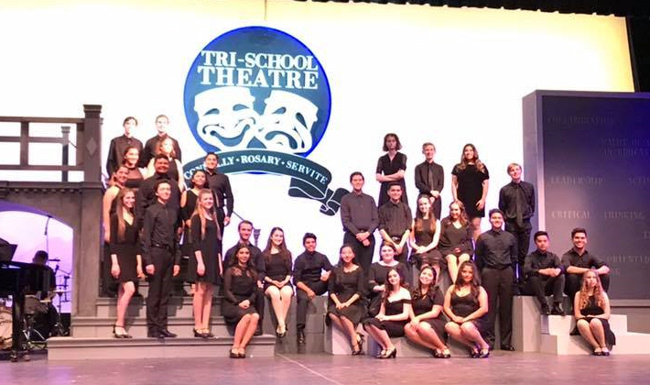 The show was tremendously successful and closed to thunderous applause on the November 18th matinee performance at the Anaheim Center for the Performing Arts at Servite. Conceived, directed and choreographed by Executive Artistic Director Frankie Marrone, the production was a solid tribute to former and current staff who played an important role in the development of the program as well as the student crews and actors who shared their time and talents for the past three decades. Featuring 27 songs from as many iconic musicals since conception, the vignettes were examples of actual shows ran during that time period. Interviews and amusing personal stories from various key production staff and cast were mixed between the numbers and projected on two large big screens near the stage in Act One. In Act Two, the concentration was more toward looking into the future, with songs selected from yet-to-be produced shows, as well as performance teasers from shows that were special requested by Tri-School students. The show was artfully performed, choreography was top-notch and the sets were inventive and constructed with sophistication by Scott Kahler, along with student designers Ben Culver, Joy Joukhadar and Marisa Lopez. Teaming the combined expertise of musicians Henry Lozano and Jonathan Mohr, Musical Director Jo Monteleone complemented the show with alluring accompaniment. The Sound was managed by Vincent Mann; Costume Design was by Mary Ann Villalobos. Make Up and Hair was supervised by Jene DeGrood, and Lighting handled by Ben Culver, Nicolas Gonzales and Adrian Uy, all contributing greatly for an entertaining trip down memory lane. Much of �Looking Back/Moving Forward�s� success relied not just on the remarkable singing talents of its cast but on the fact that they are all good actors too � all self-assured, smooth and aplomb. Focusing on shows as early as 1990, the cast had a well-rounded group of aspiring stars who have been seen on stage in various lead roles, including, Matthew Cristobal, Grace Horeczko, Hayley Johnson, Elleene Kim, Erik Mercado, Gabriela Mercado, Andy Van Driesen, Daniel Velazquez, Mia Oravetz, Matthew Martinez, Katie Thomas, Claire Early, Julia Herman, Juliana Maldanado, Hayley Johnson, Luke Mendoza, Jillian Sarni, Giovanna Watson, Anna DiCrisi, Madisen Gomez, Dam DiCrisi, Samuel George, Ryan Bass and Allison Perea. The ensemble consisted of actor/singers who supported with sublime skills and included David Anderson, Jay Arbiola, Whitney Deubler, David Graham, Thomas Huston, Michael Krager, Maeve McNaughton, Ivan Mendoza, Alyzza Munoz and Danielle Rodriguez. You can be sure that the musical memories of the latest show, "Looking Back/Moving Forward," will evoke the best of years gone by as well as bestow a glow of gratifying enjoyment for the coming year. Once again impresario extraordinaire Mr. Marrone has come up with a captivating new musical revue offering a virtual cornucopia of musical hits spanning Tri-School Theatre�s spectacular 30-year history. What we also were delighted to see were the equally multiple ways in which the show touched the hearts and souls of audience members, many of whom were teachers and staff members for much of that time. The vocal prowess and experience of this wonderful theatrical troupe continues to shine with each new show.